You uploaded OpenGL example. I make app non ogl. It is more operating system and any library independent. Thanks anyway. win3ds08. Main change is: every segment of rotated Bezier solid can be rotated independent. Choosing active Bezier segment by pressing F9 - cyclic switching. More info, please read readme.txt file. win3ds09. Bezier pipes editing option. Each segment can be rotated indywidually. 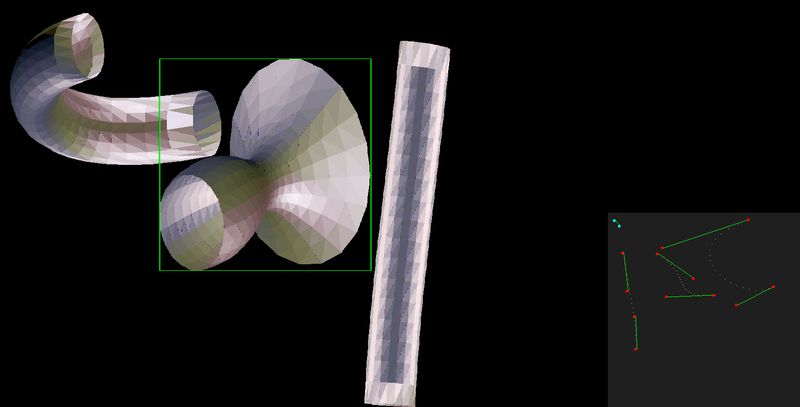 Also posibility to edit pipes and Bezier curves based rotated solids parerell. I implemented displacement mapping texture dependent. This option requires correctly declared vertexes (non mismatched senses of normal vectors). This effect looks good on objects described with many triangles - (I added dividing face into smaller faces option). Also posibility to load texture (512X512 24bit 0xRRGGBB raw uncompressed format), and simple texture moving directly on object, was added. There is such problem: when one triangle is divided to four triangles, and this is repeated a few times, arises many triangles that are on the same flat surface. So such flat area don't looks nice when only direction lights are using; (for now only such lights I implemented). Such situation need points lights. I added some GUI buttons to make work with app more comfortable. ad3 Simplest shading is flat shading. We drawing triangle filled only one color. To draw such triangle we interpolate x coordinates along y coordinate. (the begin and end of horizontal line) then we draw single line by ex. rep stosd (in 32 bit mode). Whole triangle is filled by such horizontal lines. When we want use Zbuffer we should interpolate z coord also. ad2 Drawing dots is simply drawing all vertices ( scaled and translated into app window). ad1 To draw 3d object in 2d screen we use perspective equations or we use axis z gradient (obliquity), or (so I done in my app ) just skip z coordinate (parallel projection). Sorry for to short answer, poor english. Thanks anyway for your reply. Im going to translate my tut soon. NOTE: Algorithm uses only integer variables. 1. Sort triangle vertices towards Y coordinates (from lowest to greatest). a) dx12=(x2-x1)/(y2-y1) b)dx13=(x3-x1)/(y3-y1) c)dx23=(x3-x2)/(y3-y2) when you calculate increments, numerator multiply by 256, if denominator is equal 0, then make increment dx = 0. 6. Check, if not x11 =< x12 than exchange points order (x11,y) and (x12,y). 7. Draw horizontal line from point (x11,y) to point (x12,y). 11. If y < y2 than repeat from 5 step. 15. Check, if not x11 =< x12 than exchange points order (x11,y) and (x12,y). 16. Draw horizontal line from point (x11,y) to point (x12,y). 17. x11 = x11+dx13; it means xk1 = xk1 + dx13. 18. x12 = x12 + dx23; it means xk3 = xk3 + dx23. 19.If y < y3 than repeat from 14 step. NOTE: Steps 4-11 and 13-20 should be implemented as loops. Multiplication and division by 256 should be implemented as bit shifts. These days it seems a magic to me. Anyway thank you for the push/direction. According OGL: just using it does not suffice - internals with formulas and principles do. You are right, nice improvement. It will spare some clockcycles. Maybye I defeat my laziness and implement it in my drawing_triangle procs. OGL internals just translates API function calls to GPU native commands and pushes sets of those commands (called command buffers) to the HW. There is no magic. Just huge pile of often ugly code.